The National Farmers’ Federation (NFF) and NRM Regions Australia have agreed to work together more collaboratively, to maximise the benefits achieved through collective investments in sustainable agriculture activities. 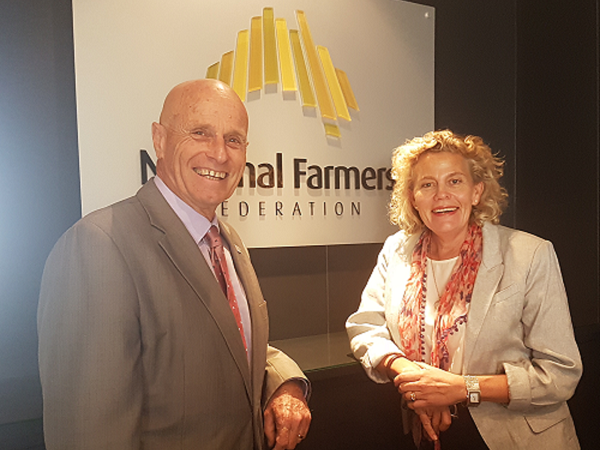 Meeting in Canberra this week, the NFF and NRM Regions will develop a formal memorandum of understanding to drive better communication, collaboration and efficiency in the way that industry and the regions interact with each other and deliver projects that benefit farmers. “The National Landcare Programme is about not only the traditional concept of Landcare, but extends to industry groups, community groups, and regional NRM organisations working together to invest in environmental and sustainable agriculture outcomes,” NFF President Fiona Simson said. “In particular we recognise the crucial role that NRM Regions play across the nation in taking a broad, landscape view and working with the community to identify local priorities for investment. NRM Regions Chair Angus Hume said Australia’s farming sector was making considerable investment in sustainable agriculture initiatives. Ms Simson said industry-led initiatives, based on sound research and linked to industry market access initiatives, were a great example of where sustainable agriculture activities deliver real benefits – for farmers and for our sector beyond the farm gate. “We need to get better at linking these initiatives to the regional priorities that have been developed by the NRM Region planning process,” Ms Simson said. Mr Hume said industry-led initiatives would give NRM Regions the opportunity to demonstrate how investing in sustainable agriculture through the Commonwealth’s NRM Programs delivered integrated benefits.